Europe The EPAA was designed to be a cost-effective method for the creation of a layered missile defense network in Europe that would protect U.S. partners, allies, and assets in the region from the growing Iranian ballistic missile threat. [v]Although the U.S. has repeatedly insisted that the deployment of Aegis BMD systems in Europe are designed to counter short- to intermediate-range ballistic missile threats from the Middle East, Russia has objected to the layered missile defense network, saying that it undermines the credibility of its strategic deterrence. [vi]Aegis systems in Europe are designed and positioned to defend against ballistic missiles coming from the Middle East and lack the technological capability to counter intercontinental-range threats coming out of Russia. While the missile defense network called for by the EPAA would be technically unable to negate or undermine Russia’s strategic nuclear arsenal, Moscow remains concerned that the missile defense system in Europe will continue to expand and impede its ability to deter what it sees as unwarranted NATO expansion. As a result, the U.S. has implemented diplomatic initiatives to educate the Russians on the EPAA and establish cooperation for European missile defense. 2020 (planned): After delays, the third phase of the EPAA calls for Aegis Ashore to be deployed in Poland in 2020. Phase III employs an upgraded modification of Aegis Ashore equipped with improved software and SM-3 interceptors to extend ballistic missile coverage to Northern Europe. To increase its range and effectiveness, the Aegis BMD site in Poland will utilize improved 5.1 software and, in addition to SM-3 Block IB interceptors, will be equipped with longer-range SM-3 Block IIA interceptors. October 29, 2018:Japan’s Defense Ministry began a field survey at the Ground Self-Defense Force training area in Hagi, Yamaguchi Prefecture for the possible deployment of an Aegis Ashore Site. September 2016: The F-35 and Aegis Combat System Successfully Demonstrate Integration Potential in First Live Missile Test. This is the first time the Aegis Combat System and the F-35 worked together. This was a joint exercise with the U.S. Navy and U.S. Marine Corps for Naval Integrated Fire Control-Counter Air (NIFC-CA). The target was subsequently engaged and intercepted by a Standard Missile 6. July 8, 2016: Aegis Ashore in Romania is placed under NATO’s command allowing the system to operate in tandem with U.S. Aegis BMD ships ported at Rota, Spain and TPY-2 radar stationed in Turkey. May 2016: Construction begins on second Aegis Ashore site in Europe. It will extend proven ballistic missile defense system protection to northern Europe. 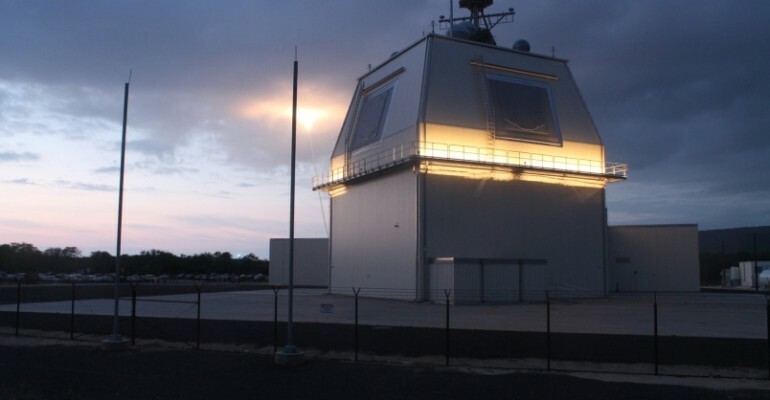 The first Aegis Ashore site in Europe, based on proven Lockheed Martin technology, is now actively monitoring the skies of southern Europe for ballistic missile threats. The U.S. Navy operationally certified the Aegis Ashore site at Deveslu Air Force Base in Romania. This officially fulfills Phase II of the European Phased Adaptive Approach, a plan to protect deployed U.S. forces and our European allies from ballistic missile attack. May 12, 2016: Aegis Ashore site in Romania declared operational. December 2015: In late 2015, the ground-based component of Aegis BMD was deployed at the Deveselu Military Base in Romania for Phase II of the EPAA. Equipped with SM-3 Block IB interceptors and Aegis BMD 5.0 software, the Aegis Ashore system in Romania is designated to provide ballistic missile coverage of Southern Europe. June 2015 The Standard Missile-3 Block IIA was successfully flight tested for the first time. The SM-3 Block IIA, co-developed by the U.S. and Japan, will fulfill mission on land as part of the Aegis Ashore system (EPAA Phase III in Poland) and in the sea on Aegis ships including the Japanese Kongo class ships. February 2015 The FY2016 MDA Budget request called for $169 million in military construction for Aegis Ashore site in Poland. November 2014 The Missile Defense Agency successfully conducted a flight test (FTM-25) of Aegis BMD technology, including components of Aegis Ashore. The system tracked and intercepted two cruise missiles and a short-range ballistic missile simultaneously. October 2014 The United States Navy held a Naval Support Facility Establishment Ceremony to install an American commander at the Deveselu facility in Romania. The ceremony was the first step in transitioning the base from a construction site to a site of operations. May 2014 The first flight test of the Aegis Ashore system was successfully conducted at the Pacific Missile Range Facility (PMRF) in Kauai, Hawaii. Tests at the PMRF will ensure that the software and hardware architecture of the Aegis Ashore system in Romania is tested on a live-fire range. September 2009: Obama announced the EPAA, canceling a Bush Administration plan to place a third Ground-Based Midcourse (GMD) missile defense system in Poland. The EPAA focused on short- to intermediate-range threats originating from the Middle East and called for sea- and land-based Aegis BMD systems to be deployed incrementally throughout Europe from 2011 to 2018. An Aegis Ashore Missile Defense Test Complex (AAMDTC) was built at the PMRF in Kauai, Hawaii and functioned as a test and evaluation center in the development of the second phase of the EPAA.